Will Rogan presents quietly intricate photographs and sculpture that continue his pursuit of finding the extraordinary in his everyday urban surroundings in his solo exhibition at Altman Siegel Gallery (through November 6, 2010). This provides him a path by which he explores themes of time, impermanence, relationships, and fragility. Similar visual elements also repeat: eyes, light reflected off shiny surfaces, portraits. Each theme or visual element will pop up in several pieces, but none is present in all of the works. For the viewer, it presents a fun game of “find the similarities” among the different works; they are evident in big ways and small details. In several instances, themes loop over themselves, adding layers and complexity. Viewing the Past as it Happens, Men Versus Clock: the Unequal Struggle, and The Elusive Nature of Time are each a photograph of a spread from a book about time; the titles of the works are the topic that is covered in the spread. The book itself is clearly dated. It has become a victim of the topic it addresses. The photographs themselves document a moment, which immediately becomes the past. They can never capture the present because as soon as they do, it is gone. Nothing is permanent. Impermanence is also present in Can and Glimmer. 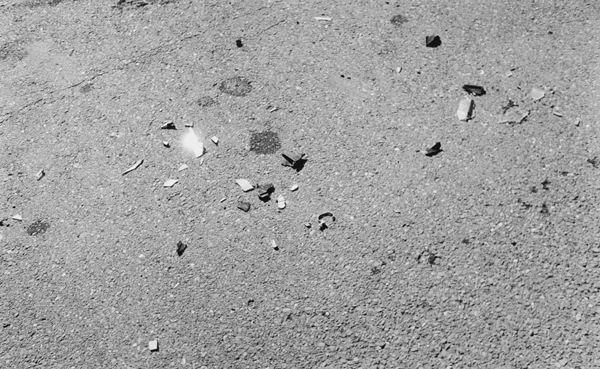 Each image features an instant of the sun hitting a reflective surface – an aluminum can in the former; a piece of broken mirror in the latter – providing a flash of brightness in an otherwise dull and ugly landscape. These are two more examples of Rogan highlighting something “fantastic,” however brief, where otherwise we would see only decay. Rogan has that wonderful ability to create work that is both complicated – there’s so much going on it can make your brain hurt, or alternatively jump for joy – as well as peacefully evocative. At times images are downright elegant and beautiful. When drawing our attention to a googly eye reflected in a mirror in The Floor, he also permits that serious are can be quite playful. 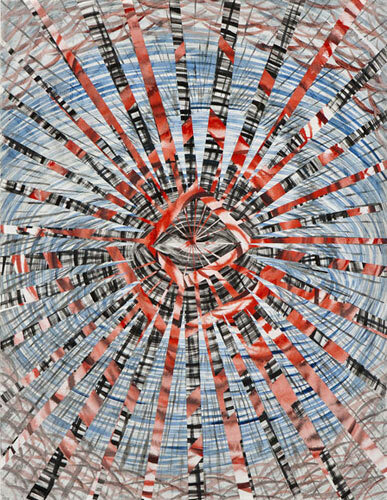 San Francisco artist Andrew Schoultz’s newest work (on show through October 23, 2010) comes at you like an explosion. It’s big, bold, and colorful. It’s also serious, playful, and chaotic. The show features collage and acrylic paintings, monotypes, and large-scale sculpture. Throughout, Schoultz utilizes graphic/illustrative imagery regularly featured in past work as well as his exquisitely detailed line work. In every piece there is more than a lot going on. They work on numerous levels, foremost hovering between representation and abstraction. They are a brightly twisted playground for the eye and the mind, a trip down the rabbit hole with serious social commentary. Like that of any good storyteller, Schoultz’s narrative does evolve, often to address current events. Reclamation, Oil, Water, for instance, is a commentary on the Gulf oil spill. The tornado (loss of control to nature) and eye are present. Schoultz also throws in a few other not so subtle but well placed ideas: the rippling water creates a camouflage pattern (war for oil), and the shimmering silver paint on a structure being transported on the water looks a lot like an oil slick (the true cost of global commerce). Not to be overlooked is Schoultz’s use of color, which plays out in several ways. Red, white, and blue figure prominently in several works (a flag reference). And the messages are clear. In the large wall sculpture Broken Wall (in Three Parts) the American colors are separated to suggest a country divided or breaking apart. And gold, on bricks no less, figures prominently, especially in the enormous (and self-explanatory) Brick Wall (Gold). Color also contributes to the many ways any given piece can be experienced. Explosion, a work made of layer upon layer of collage and innumerable graphics and images, as well as pieces of dollar bills, features numerous accents of different neon colors. From far away, these punchy tones read like a fairly un-modulated color-field painting. Up close, the eye reads color frantically in this wonderfully active work. 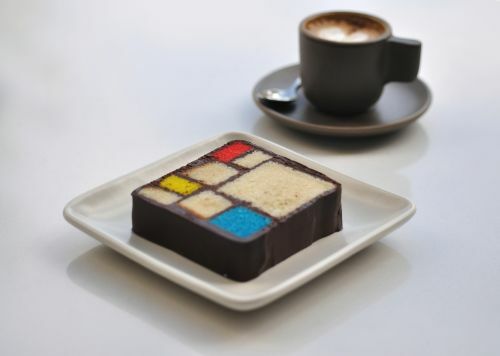 Several months back, I was ordering a cappuccino at SFMOMA’s new rooftop sculpture garden, and I noticed a dessert offering that uncannily resembled a Piet Mondrian painting. Another looked a lot like a Wayne Thiebaud cake. Looking closer, I saw that all of the desserts had ties to artwork. And I was right; these unique sweets are the creation of resident pastry chef Caitlin Williams Freeman and can only be found in this singular location. And though the idea of making art-inspired treats came to Caitlin in a flash, the full-circle journey to this took a decade. 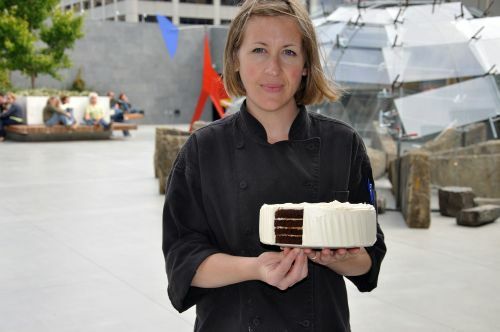 I sat down with Caitlin at the rooftop garden on a recent sunny day to discuss how she went from being a photography student at UC Santa Cruz and pastry shop counter girl to developing her own baking and pastry niche. Chérie Turner: Can you tell me about your art background? Caitlin Williams Freeman: I was at school in Santa Cruz in the photography program, and we would come up here [to San Francisco] a lot to see various gallery shows. And we would always come to the museum. That’s when I first saw Wayne Thiebaud’s painting [Display Cakes], and I was captivated. I didn’t know what I wanted to do with it. I just really, really loved that one particular painting. CT: And how’d you get started with baking? CWF: In college, I worked at this pastry shop. I was just a counter girl, but I was so obsessed with pastries. Years later, I ended up meeting the woman [Megan Ray] who became my business partner. She had just gotten laid off at a dot com and had never worked at a bakery. But she decided she wanted a cake shop, and so, the two of us were enthusiastic enough that we would just work all hours. We would do farmer’s markets. Then we were offered a space in the ferry building. That was October 2003. Working at Miette [the cake shop] is how I met James [Freeman, owner of Blue Bottle Coffee]. He was my next-door neighbor at the Berkeley farmer’s market. It’s a long story–then in 2008, I sold my part of Miette; it was actually the same day James and I got married. I took a few months off after that and made pastries for James, for Blue Bottle. I figured I’d do that for a while, and then I’d go do my own thing–open a pie shop or something. Shortly after that, the museum [SFMOMA] asked James to open a coffee shop here [at the rooftop garden]. So that was the plan: I was going to make Thiebaud cakes in the place where I became inspired to become a baker. It felt so perfect. It had taken me ten years to get here, but it couldn’t have happened better if I had planned it. CT: But you did more than just Thiebaud cakes. CWF: Yes. To figure out what else I was going to make, I went and soaked in every piece of art that was on display and tried to figure out what to do. And it’s fun because, with the exception of the Thiebaud cake, which we always have on the menu whether or not the painting is hanging, we really keep the desserts limited to reflecting what’s actually on display in the museum. So when a new show comes up, we make a new dessert based on what will be showing. CT: Can you talk about the process of coming up with new desserts? CWF: It’s generally something I’m really inspired by. But you also have to be in tune with what are the popping pieces, the pieces you just can’t miss. We have this Agnes Martin piece right now that we’re working on, but I really wonder, “Is anyone going to get this?” It’s such a subtle piece, and it’s such a subtle product that we made, and I think it’s just perfect and delicious. But I have no idea if people are going to connect to it. In that case, then, we try to come up with something that is interesting in another way. We have both the artistic angle and the food angle, so if we have something that’s a little more abstract, we can try to make it a more beguiling flavor combo. I’ve been inspired in many different ways. Like the Mondrian cake. I distinctly remember going past the Mondrian painting, and I kept thinking, “What can I even do with that?” I knew I had to do something, but I didn’t know what. Then I happened to be looking through this old cookbook of Victorian cakes. There’s this old cake called the Battenberg cake; it’s an old British cake. When you cut it, it’s a checkerboard. And I was like, “There it is!” So that ended up happening by finding a cake that was an inspiration and seeing the structure and figuring out how to turn it into art. 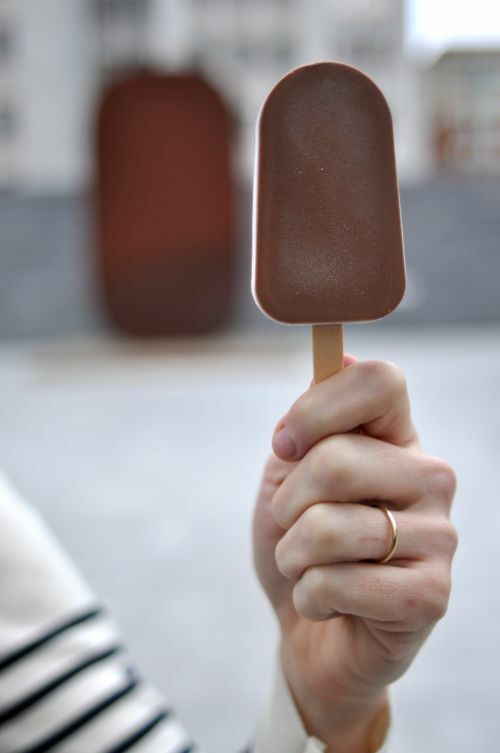 We’ve also been really liking these do-it-yourself art/dessert pieces, like the Richard Serra piece. We’re just about to do Alexander Calder build-your-own mobile cookies. CT: So, what is your overall general approach to developing these desserts? 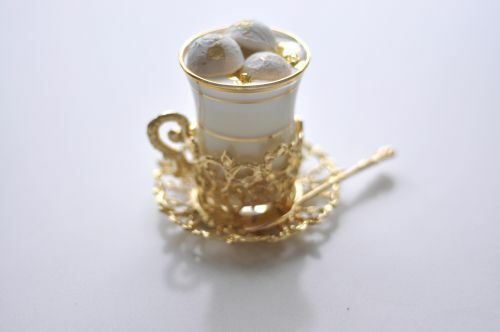 CWF: We keep two worlds in mind [art and food] and see where they can cross over. Some are really obvious, like the Thiebaud and [Richard] Diebenkorn, and those we feel like we have to have because people can connect with them really easily. But I don’t ever want to recreate a piece of art. It’s our interpretation of it.